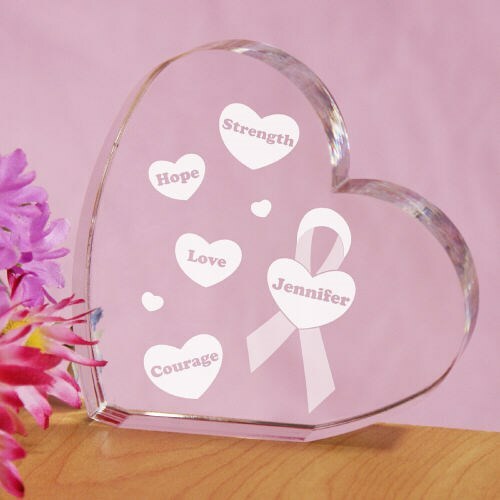 Show the Strength, Hope, Love and Courage you have taking on this disease when you proudly display this beautiful Personalized Awareness Keepsake Heart. This unique keepsake will remind you every day to never give up hope and is a great way to help spread awareness each day. Our keepsakes also make for unique breast cancer awareness gifts for anyone who is fighting. Our Personalized Awareness Heart Keepsake is available on our crystal clear, heart shaped keepsake. Each Personalized Heart Keepsake measures 3 3/4" h x 4 1/8" w. Includes FREE Personalization. Personalized your Awareness Heart Keepsake with any name. Touched my grandma's heart! She is a survior and fell in love with this! I highly recommend it to give to anyone who is a surviver. A small gift from the heart! MyWalkGear.com is dedicated to raising awareness of every disease. Stop by today to view our collection of Awareness Apparel and Keepsakes for any upcoming walk you may be participating in. You will feel great with every purchase you make because MyWalkGear.com will donate a portion of the proceeds to help fight this disease once and for all.